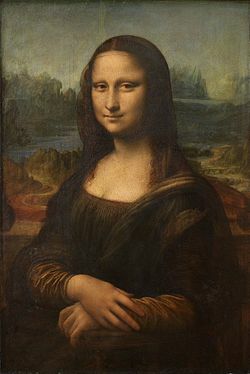 I've been watching the news about Da Vinci's "Mona Lisa," where some are speculating that there are codes embedded in the painting and that, due to these hidden clues, there is a secret waiting to be divulged! In her eyes, they see letters and numbers; elsewhere in the painting, other letters and numbers. Given the never-ending questions about the famous "non-smile" in this painting, questions about "who this really is," and the recent works of Dan Brown, including "The Da Vinci Code," "The Lost Symbol," and others, it's no surprise that people are still trying to figure out what important secret Da Vinci was hiding or what message he intended to leave us. I should get right to the point of the matter here and let you know that I have solved the mystery of the letters and numbers, that seemingly appear within the painting, and what Da Vinci was up to with the "Mona Lisa." Now, the answers to the eternal questions! I did not come to this glibly...I am an artist, so I have some experience in putting forth meaning and messages on canvas, and I have listened to and heard some of the "evidence" put forth by others. 1. It has been touted that Da Vinci toted this treasure to Tuscany and back, from the moment he started it until he finished it just before he died. 2. The picture has many elements of painting types...portrait, landscape, seascape, and still life. 3. There's the "enigmatic" smile. No fun, no emotion, straightforward. 4. Numbers and letters, such as "D," and "L," and "7", to name a few, appear in various spots within the painting. 5. According to records, it was never finished while Da Vinci was moving around...he didn't put the last brush stroke on it until after he couldn't travel anymore. Da Vinci was a traveling salesman. "Mona Lisa" was his "sales kit." He took it everywhere. In order to be able to sell canvas, paints and brushes, he had to be able to show that you could use his stuff to paint any kind of picture! Portrait? No prob. Seascape, landscape, still life? Go ahead, knock yourself out...do them all at once! He couldn't paint someone smiling or laughing. This was business. People like to know they're spending their money on serious objects that they, in turn, can use to make money. The numbers and letters? His "cheat sheet!" While he's showing what the stuff can do, people ask questions...what color did you use, what size brush, what kind of canvas? Luigi asks, "Leo, che spazzolla (brush)? Che colori (color)?" Leonardo sees "V" and "7" that he wrote into the painting..."Verde" (green), he responds..."Spazzolla numero 7." It's like PowerPoint! And it was something he painted on as he showed his wares. As he traveled the cities and towns, carrying it about, he would paint on it showing people how his supplies would be the best for them. When did he finish it? When he didn't need to use it for sales promotions anymore. In fact, one day after he retired, while having a cappuccino, he looked at it and said, "Not bad. I could probably just paint over the numbers and letters and sell this thing...could use a few lire!" And then he thought, "Probably some day someone will see those numbers and letters and think that I have a great secret or it's some mystic code! That would be funny!" And, as for the mystical triangles and squares...they sell protractors, don't they? It's not that there aren't "things" in paintings. A good friend of mine gave me a painting years ago. A very nice watercolor, he handed it to me with the comments, "I hope you appreciate the fact that I broke the tip off my favorite palette knife doing this for you!" I did. After framing it, I looked closely one day as there appeared to be something 3D in the picture. Right there in the painting? The tip of his palette knife. The painting is here, above, on the left. The knife tip is on the right side of the painting, above the top rock on the right...the dark spot in the base of the tree/weed. Of course, generations in the future will, no doubt, be sure that we were smuggling precious metals via artwork or setting up magnetic codes that, once all paintings with metal tips in them are lined up with magnets, would lead the world to Atlantis. Whatever! And, the secret in the painting that I did, below here on the right? I was trying to paint something that I could put in the hotel gift shop that I thought someone would buy! The other secret? It worked...the painting was only in the shop three days. There are many things in paintings. Dust, dirt, sand (see Monet), oil, water, bad chemicals, and many other things, including things we don't want to think about. Remind me to tell you about the time I sneezed during a watercolor demonstration. Oh, before I forget. The biggest idea an artist puts into a piece of art? A keen desire to sell! That's actually a BRILLIANT theory on DaVinci! You better not let Dan Brown get a hold of it...I'm sure he wouldn't share any royalties with you! !